Years ago, I took a college class on Environmental Economics. It was a fascinating course. Interestingly, the most effective strategy identified for control of pollution (it was real pollution being discussed back then, not the made up kind that dominates discussion today) was to dramatically increase the cost of polluting by affixing taxes to the discharge of undesirable materials. It appears that the same strategy is being applied in I-1639. Economic coercion is a powerful force for behavior modification when the targeted population does not have the ability to absorb the penalties with impunity. 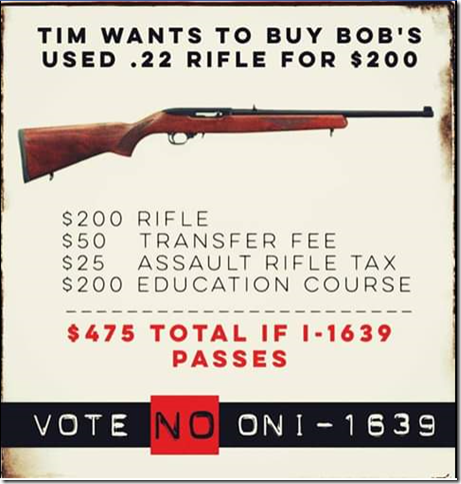 That is why there is another reason to vote NO on I-1639. It will have no effect on wealthy individuals. They will thumb their noses at it just as surely as they currently do in places like New York and California with their hired guns. It is truly targeted at the average law abiding individual that wishes nothing more than to be secure in their personal rights and liberty. Just another example of the disdain that upper echelon Progressives have for the “little people”. It is remarkable to me that there are also so many of the “little people” that are willing and useful idiots for Progressive policy and cannot figure out where they will end up if the full implementation of Progressive policy takes place. 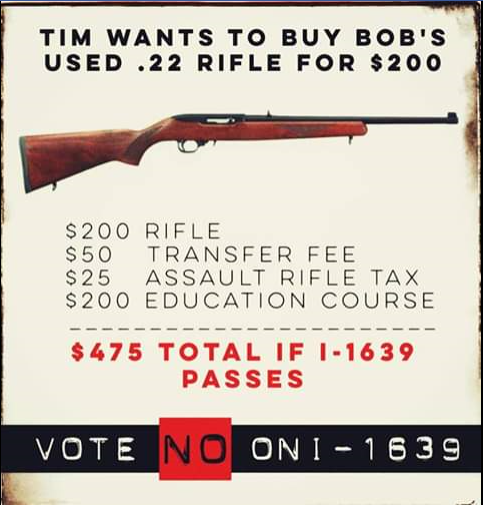 Tim wants to by Bob’s used 10-22. Tim doesn’t fvckin’; care – nor does Bob, since his boss told him not to bother enforcing this POS law. Tim and Bob step out side the shop and pop off a few rounds into the shooting stump. Liberal assholes in Seattle think they’ve made a major dent in crime. It’s called Irish democracy. The government passes some odious law or regulation and the people simply ignore it. New York’s SAFE act has close to a million scofflaws. Connecticut’s assault weapon registry has so many scofflaws, I last estimated that they have 7 scofflaws for every prison bed in the state. Perhaps the gun banners can tell us how this makes them safer?